Are Your Stores In Decline? Outcalt and Johnson have developed a succinct diagnostic tool for retail viability. They have identified eight "vital sign indicators", and the characteristics of each one at a different stage of decline. You can use this to assess any retail business – including your own! It's easy and fast to do. For each of these eight "vital signs" indicators, simply note which stage your stores are in today. Stage One? Two? Three? How many Stage Ones did you check? Stage Twos? Any Stage Threes? 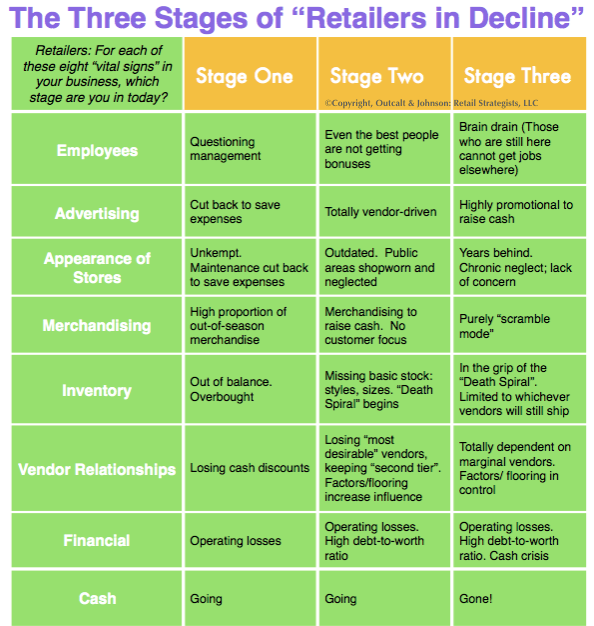 Remember, most retail businesses are in some aspect of Stage One at any given time. But...more than one Stage Two or Stage Three? Let's talk! The sooner, the better.